What about Christmas traditions? I’m getting to see some of them via my boyfriend (Swedish raised and now living in the US). He has a Christmas gnome that shows up “magically” on the first advent Sunday, and of course an advent calendar. I must admit that with his Christmas celebrations beginning early December it makes the holidays extra jolly. And we will be watching the Lucia ceremonies next week. @lola – A huge tradition they have here is to watch Kalle Anka. Sweden LOVES Donald Duck. Every December 24th, at 1500 the entire country huddles around the TV to watch Kalle Anka. This has been going on since the 60’s. Between 3 – 4 million people watch it, that’s roughly 33-44% of the country! Another ones are Julbords (Christmas Tables), Sankta Lucia with her procession (every section of town has their own Lucia voted in). Oh I love Christmas ham, I made one with a bit of a South African flare to it last year. 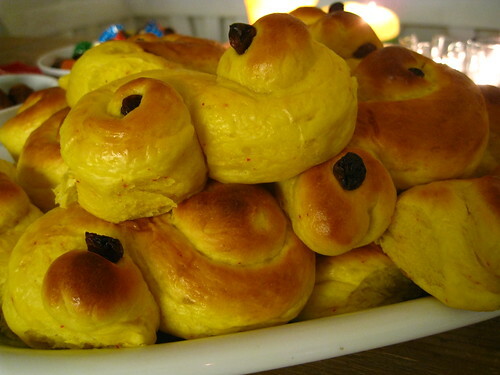 My mother-in-law makes those great saffron buns and combining that with Julmust is heaven. Actually I think Julmust is my favorite Soda. Saffron threads or saffron powder for lussekatter? Erik – Saffron threads will give a stronger, more floral taste. You can use less of them. The downside is that they are expensive. Saffron powder is basically the leftover of the threads during separation. It’s not that strong or flavorful, but the price can be more reasonable. I’d visit an Asian grocery store if you happen to like saffron. A Spanish saffron box (10-20grams) can be a good investment if you love cooking. Will save the saffron threads for the rissotto! Ah the most important part is the rice. My mother always made geel rys. It’s rice with turmeric, cinnamon, sugar and rasins. Google it and you find the exact ingredients, it’s a very common dish. The fish is marinated and then grilled (Yes bbqing in the winter is not fun in Sweden, but we got a propane grill even if its outdoors) and i usually just season it heavily with whatever i think fits. Not sure if there’s ONE way to do the fish. I usually have my Hubby go out and buy a white flesh fish called Gös, not sure what its called in English. It’s not exactly a very Swedish Christmas dish but, then again in SA Christmas is more about the religious part. 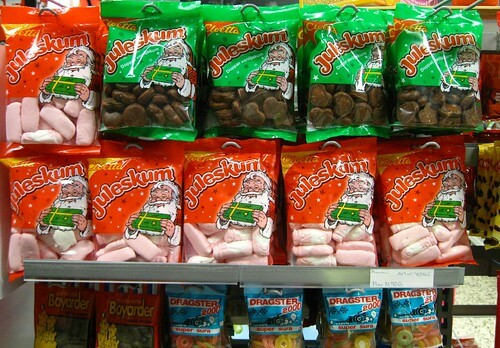 Well, one thing that’s good about Christmas in sweden. I don’t have to go to the Methodist church. try Iranian saffron; you’ll never use Spanish again. Ris à la Malta is with wipped cream and sometimes with almond bites..
thanks for a god lauth!!! Wow, can someone simplify this for me. 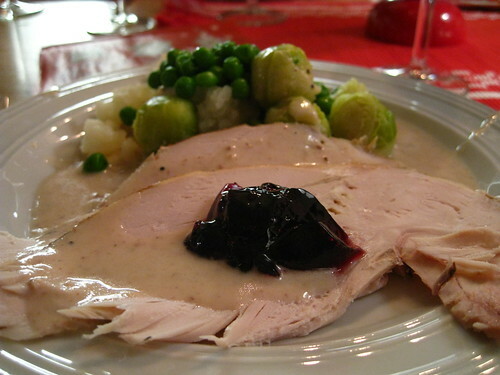 Would like to have a traditional Christmas Swedish Christmas meal for the first time (dont shoot me) . The more I read the more complicated it seems. Can someone help me with a simple plan that I can expand on next year and next etc. I couln´t help reading that you don´t like Janssons frestelse. I can tell you that not every swede like that dish. So, for several years we didn´t have Janssons at our julbord until my dear mother found a recipe in a paper on a different kind of Jansson. Instead of anchovies, we nowadays use gravlax (raw spiced salmon) and it´s a dish a can´t think not to have on christmas. 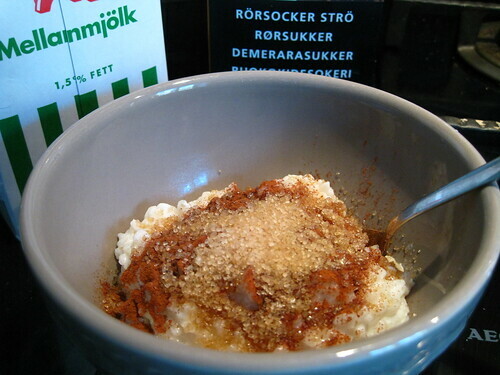 People and specially kids love this different Jansson. I took the time to translate the recipe, I hope someone find it useful. Happy holidays! Sätt ugnen på 200 Celsius. Skala och strimla potatisen. Strimla purjolöken och grovhacka laxen. Fräs purjolöken mjuk i smör i en stkpanna. Blanda potatis, purjolök, salt och dill i en stor ugnssäker smord form. Häll på grädden och strö över ströbröd. Grädda mitt i ugnen i ungefär 40 minuter. Sedan kan du antingen servera, eller låta kallna för att frysas in. Fryser du in laxjansson är det viktigt att den får tina i kylen och att det hälls på lite grädde innan den värms i ugnen i ungefär tio minuter på 200 Celsius. Preheat the oven to 392 Fahrenheit. Peel and shred the potatoes. Shred the leeks and roughly chop the salmon.Fry the leeks soft in butter in a frying pan. Mix the potatoes, leeks, salt and dill in a large ovenproof greased dish. Pour in the cream and sprinkle with breadcrumbs. Bake in the oven for about 40 minutes. Then you can either serve, or allow to cool to freezing. Are you cold in laxjansson it is important to get the thaw in the fridge and it poured on some cream before it is heated in the oven for about ten minutes at 392 Farhrenheit..